Our mom is Punky and our dad is Kash. We were the product of a Puppy Mill. 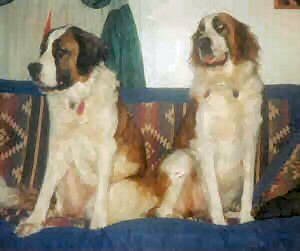 Our parents were raised in a puppy mill in Brown County Ohio. Mom had litter after litter of puppies. One day the rescue heard that the puppy mill might sell mom and dad so she asked the Brown County Dog Wardens to go and check them out. Well $100 later mom and dad arrived at the rescue. The puppy mill owner said mom was not due to deliver for weeks but the rescue did not believe her. Three days later we were born! Amber was the bigger of the two of us and well she was the first chosen to be adopted but after a year and I was still at the rescue Amber convinced her mom and dad that she really needed her sister to come live with them also. So now Amber and I are together in our forever home!! Mom and dad are the best!! 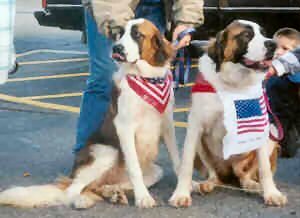 Here we are the day I was adopted, we were in a big parade that day! !